By Brandon Lopez in Travel & Leisure on January 22, 2019 . Bali is one of the most favorite place to go when it comes to vacation. This island of Gods has everything you need for memorable vacation. Natural beauty, sweet people, deep culture, and foods are amazing. That’s why it is like a must to visit Bali from wherever you are at least once in your life to truly experience the real vacation. Aside from the culture and amazing places to visit, Bali also has delicious, authentic local dishes you should try. Travelling without trying the local foods is not complete. Foods are part of the local culture that you cannot only enjoy but learn about. Betutu is one of the most iconic Balinese dishes. It consists of a whole duck or chicken stuffed with traditional spices. It is usually wrapped in banana leaves and enveloped tight in banana trunk bark before it is buried or baked in a coal fire. It can take 6 to 7 hours before ready to serve. The texture of Betutu is juicy and rich with flavor. It is easy to separate the meat from the bone after being cooked for so long. It is often served with rice and Sambal Matah. When you visit Bali, you must not skip Jimbaran as from your itinerary. This is one of the most favorite places to go because here you can enjoy the best seafood. Jimbaran seafood has been famous amongst tourist in Bali. There are many cafes and restaurant around Jimbaran Bay which serve grilled fresh caught seafood. They range from crabs, shrimps, clams, calamari, lobsters, and wide variety of fish. Every café usually has secret recipe of barbeque sauce and condiments in a form of Sambal Seafood Jimbaran Style. 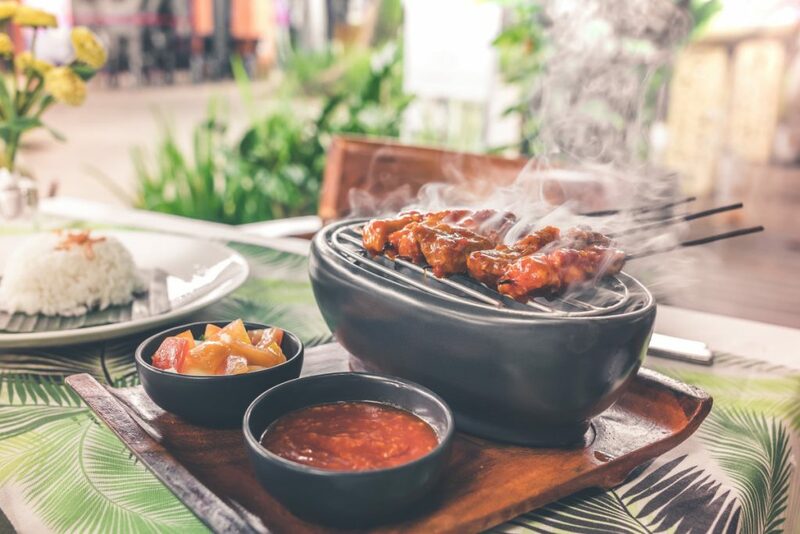 Babi Guling is another authentic local dish from Bali. However, it is not for Muslim travelers. Thus, make sure to ask what you are going to eat in Bali beforehand. This is a dish conceited of spit-roast pig stuffed with mixes of rice and vegetables. It is then slowly rolled over a coal fire. That’s why the name ‘guling’ means to roll. The meat is tender and juicy along with crispy skins. You can find dish dishes in almost every restaurant in Bali. Lawar is a dish consist of mix containing chopped meat,, vegetables, grated coconut and some spices. In some areas in Bali, Lawar is prepared using fresh blood mixed with the spices and meat to strengthen the flavor. There are two types of Lawar. They are white and red. The red Lawar is the one with fresh blood mixed and white Lawar is without. You can choose the one of them or both to try.